Caption from our May 16, 2009 post "The Big Lie that is the commentariat's narrative of the Obama presidency": "Let everyone reject the destructive power of hatred and prejudice, which kills men's souls before it kills their bodies!" Pope Benedict told "tens of thousands of adoring followers in Jesus' childhood hometown" of Nazareth "with a message of reconciliation" Thursday. By moulding the hearts of the young, we mould the future of humanity itself. And there's the rub, the tragic vs the utopian view of human nature that we're forever flogging here . Generations of young hearts have been stunted through the soul-deadening p.c. propaganda of the decades-long Gramscian march through the institutions. The 18th-Century Pats believed, as John Adams wrote, that "Children should be educated and instructed in the principles of freedom." But in the wake of the 20th-Century Gramscian march through the institutions, promulgated through the insidious propagandizing of future teachers by "critical pedagogy" proselytizers like President Obama's old pal Bill Ayers, all too many children of the 21st-Century — even some of the best and the brightest who sit on the editorial board of the Harvard Crimson — don't seem to understand the fragility of this thing that is their birthright. In Ben Franklin's words, oft quoted here, "A republic, madam, if you can keep it." In reflecting on the spiritual victory of freedom over totalitarianism in his native Poland and in eastern Europe, [John Paul II] reminded us that history shows, time and again, that "in a world without truth, freedom loses its foundation," and a democracy without values can lose its very soul. Sissy Willis is looking at the big picture from a religio-political perspective. I actually got to know Jackie a couple months ago on Twitter. When I first met her, I was struck by how mature, articulate and intelligent a young woman she was. Like me, Jackie became politically involved because of Sarah Palin. She is an amazing girl, and I wish I had become politically aware when I was her age. While she may be young, she is already a very talented blogger who has a great future ahead of her. I actually recently wrote about her and other great, young conservative bloggers who are out there making a difference one post at a time. I find it so amazing and incredible that Sarah has brought so many people together. While Jackie and I do not know Sarah personally, we and millions of others have formed a bond that will last a lifetime. "The so-called 'Staircase Group' by Charles Willson Peale (1741-1827) is arguably the first major original painting in American art," writes collector and curator John Wilmerding in today's WSJ. Read the whole thing for its historically and aesthetically rich appreciation of the Philadelphia-based artist, inventor, scientist, soldier, writer, naturalist and museum founder. The take-home point for our discussion here: "The full-length format … speaks to its final originality. Heretofore it was reserved in the Old World for upper-class and royal portraiture. Peale inverts its use for American figures who are ordinary, relaxed and democratic." Sarah Palin and the Tea Party/Town Hall Movement come to mind. We were never looking to own or control it. The focus needs to be on the issues at hand. Asking the “who’s in charge” questions about the Tea Party movement is to fundamentally misunderstand conservatives. Conservatives do not like being told what to do. The notion of subsuming self-interest for “the greater good” is anathema to them. That makes replicating the Borg-like work of ACORN and Moveon.org organizations nearly impossible on the right. When conservatives see a goal, they’ll take 50 roads to get there. The left will get on the Huffington Post highway and ride along together. Let's remind ourselves of what the essential part of a representative democracy is all about. It's a town hall meeting. Who's in charge of a town hall meeting? Nobody … There are rules and procedures so that equals can come to an assignment of responsibility based on their equality. There's something about Sarah Palin that drives a certain kind of liberal wild, and I don't know why. I'm not a psychiatrist. But I personally wish she'd stop calling people "sexist." That's what liberals do. Carlson may not know why Saracudda drives a certain kind of liberal wild, but we do. 'Been blogging about it for years: It's the tribalism, stupid. Update: Instalanche! Thank you, dear professor. Update II: "I am the last person in the entire b-sphere to link it, but I’m delighted to do so, writes Attila Girl." Never too late. "Men who will deal likewise with their fellow men"
Cardinal Tarcisio Bertone said the Pope's image as a German "panzerkardinal" was unfair. "He is human and he will convince you," he said. "He is both a man of science and of faith. He possesses a great sense of humanity, he loves nature and music." The same churchman said that Cardinal Ratzinger was a cat lover. "Every time he met a cat, he would talk to it, sometimes for a long time. The cat would follow him. Once about 10 cats followed him into the Vatican, and one of the Swiss Guards intervened, saying 'Look, your eminence, the cats are invading the Holy See.'" "He loves to debate with you, not only about theology," the bishop [of Munich] said. "He plays Mozart on the piano before he goes to bed at night." 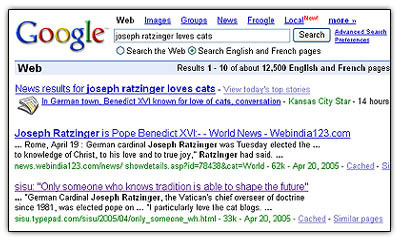 A Google search of "joseph ratzinger loves cats" brings up our blog in the number two spot. That was before we even knew that Pope Benedict XVI is an ailurophile. Google combined two unrelated bits: "Joseph Ratzinger" in the body copy of one of our posts plus "I particularly love the cat blogs," a testimonial in our Kudos list. Is it one of those "miracles and wonders" Peggy Noonan spoke of yesterday? The house — built in the 1970's style on a quiet street with a walled garden -— has the feel of an oasis. A bronze sculpture of the Virgin Mary gazes over beds of roses and daffodils, while a statue of a cat stands next to a sliding-glass door. The pope, Mr. Hofbauer said, adores cats. His most heartfelt talks may have been the ones he gave after celebrating Mass. "I went with him once," said Konrad Baumgartner, the head of the theology department at Regensburg University. "Afterwards, he went into the old cemetery behind the church. "It was full of cats, and when he went out, they all ran to him. They knew him and loved him. He stood there, petting some and talking to them, for quite a long time. He visited the cats whenever he visited the church. His love for cats is quite famous. [His housekeeper] pointed up a staircase to a wall full of painted plates, each depicting a different cat. The brothers collected the plates together, she said. "When we were on vacation, a cat, a little kitten, would come by, and he'd be giddy, almost giggling with joy," she said. "Cats love him; they always go to him straight away. And he loves them back." He loves cats, he plays Mozart on the piano before he goes to bed at night and the dictatorial relativist Left is apoplectic. Hallelujah! Rather, we are called to conform our choices to the subtle yet nonetheless perceptible laws inscribed by the Creator upon the universe and pattern our actions after the divine goodness that pervades the created realm . . . The cracks … in Obama’s Pentelic statuary … will widen, because in about six areas he has taken on human nature itself, age-old logic and common-sense opponents that even a Harvard Law degree and Chicago organizing are no match for. Through his willingness to engage with those who disagree with him and encourage people of faith to bring their beliefs to the public debate, he is inspiring this nation to heal its divisions of religion, culture, race and politics in the audacious hope for a brighter tomorrow. "I don't see any evidence that President Obama takes the moral arguments of those who disagree with him on the life issues seriously," Weigel told FOXNews.com. "This was most clear in his address at the time he announced the federal government's stance on embryonic destructive stem cell research." Israel may be ready for a two-state solution. And the credit goes to ... not Benedict, who Netty just met with, but OBAMA, with whom he will meet soon. Isn't Obama amazing, though? No credit to Benedict! Exactly what I was thinking as I caught the headline on Drudge this afternoon. Reminds me of the old Christmas story Why the Chimes Rang. Ronald Reagan would have understood the Lord's -- and the Pope's -- mysterious ways: You can accomplish much if you don't care who gets the credit. Update: "Even committed secularists need their godlings," writes The Anchoress, who links -- Thanks! -- in "Post Pope, Israel may support 2-state solution - UPDATED." Benedict didn't mention Eluana Englaro by name, but it was clear he was referring to her case, which has made headlines in Italy for months. Englaro has been in a vegetative state since 1992 after a car accident. She was 20 at the time. Oh, yes. Terry Schiavo. We came down on the other side of that debate from our usual philosophical allies, big time. In that case, the parents wanted to keep the feeding tube in place. In the Italian case the father wants it removed. In both situations, an obscene bureaucratic fiat just says no to an intimate family decision that should be nobody else's business. Been there, done that. "All too often the United States starts by dictating"
A lion cub can roar at a pope. "The beast was brought to the pontiff in the Vatican's Paul VI hall on Wednesday as part of a performance by members of the Medrano Circus … The lion's response: a roar, which drew laughter from the Vatican audience." (AP Photo/L'Osservatore Romano, HO) We happen to think the "roar may well be more of the pussycat's social yawn — or maybe akin to the feline hiss — but that's open to debate. No question, though, about Papa Ratzi's adoration of his feline "suppliCAT." "And so what I told [envoy to the Middle East George Mitchell] is start by listening, because all too often the United States starts by dictating — in the past on some of these issues — and we don't always know all the factors that are involved," said the newly minted Leader of the Free World, displaying his slippery, disingenuous language of Arab-style diplomacy larded with BDS innuendo for all the world to see. "Dictating?" Can you say projection.? Pardon us as we gag. Meanwhile Pope Benedict XVI noted that "While I renew with affection the expression of my full and unquestionable solidarity with our (Jewish) brothers, I hope the memory of the Shoah will induce humanity to reflect on the unpredictable power of hate when it conquers the heart of man." "An amused Benedict looked on as jugglers in sparkling costumes performed. He got up when the lion cub was carried closer so he could pat it." [Robert Wood, acting State Dept spokesman]: Well, I think, clearly, if you see some of the initial reporting that’s come from the region, there’s been a really, really positive reception to the President’s interview. And I think it shows, based on what I’ve read so far in terms of the reaction from the region, that people are very, very pleased with the President’s approach and the fact that he really wants to engage seriously in a dialogue with the people of the Middle East, a two-way dialogue. Egad. If only he really wanted to engage seriously in a "two-way dialogue" with the people on the other side of the aisle in Congress and such as ourselves. But he doesn't. His way or the highway. "I won." "Wolfgang Amadeus Mozart's Great Mass in C minor 'resounded through the elevating ambiance of the Sistine Chapel'" at a recent concert given by the "Regensburger Domspatzen" orchestra and choir in honor of Pope Benedict XVI's brother Msgr. Georg Ratzinger (left), maestro di cappella emeritus, apostolic protonotary, for the occasion of his 85th birthday. Screen grab from a Catholic news service H2O video report of the event. In the presence of the choir, orchestra and guests, the pope told his brother, "The 85 years of your life were not always easy." The pope said his parents had lost all their savings in the 1930s, then a new economic crisis enveloped the world, then the Nazis came to power and World War II broke out. 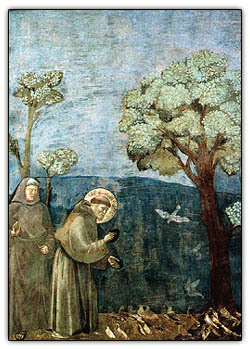 But the brothers found "hope and joy" after the war as they returned to the seminary and were ordained to the priesthood together in 1951 …Pope Benedict said his brother discovered almost from the beginning the fact that God was calling him to exercise his priestly ministry while using his musical talents. Tiny strikes a soulful pose atop the dining room table this morning, thinking, perhaps, of her own brother, whose loss has left an empty place in our hearts. Freedom is not only a gift, but also a summons to personal responsibility. Americans know this from experience -- almost every town in this country has its monuments honouring those who sacrificed their lives in defence of freedom, both at home and abroad. No wonder the great man has won our heart and soul. Listen to the Kyrie of the Great Mass here. Sing along with virtual sheet music here. Our own favorite version, featuring Kiri Te Kanawa and the Academy and Chorus of St. Martin in the Fields under the direction of Sir Neville Marriner CD available for purchase here. Fun fact: Sir Neville was conductor for the soundtrack of "Amadeus." Update: Bird Dog hears the music. "I also doubt they are calling themselves Sissy with any kind of ironic intent"
What is it? The bleached remains of some long-ago army column defeated by enemy forces or perhaps the forces of nature in desert warfare? Look a little closer and you'll see the remains of a family of tiny Pantry Moths — who knew that's what mealy worms turned into? — who had lived out their lives inside an old can of Ghirardelli chocolate powder in the farthest reaches of our kitchen cabinets. We tossed the chocolate powder but learned a thing or two about death by chocolate and parallel lives. I also doubt they are calling themselves Sissy with any kind of ironic intent. Which also suggests their grasp of English is as bad as their understanding of climate change, or since they seem to consider the current Pope to be some kind of hero, their grasp of morality. They/themselves/their? Didn't you mean she or he, sir? Had Penfold delved a bit further, he might have been puzzled to learn that along with Pope Benedict XVI, Charles Darwin is one of our intellectual heroes. But then for him, the debate is over, the scientific consensus is in, and Sissy Willis is insane. Talk about parallel lives. "From so simple a beginning endless forms most beautiful"
February 12, 1809 isn't just for fans of Abraham Lincoln. Another great man whose legacy — like Honest Abe's, larger than life — inspires and enlightens ever more with the passage of time, was born the very same day in the very same year. Darwin's Shrewsbury (graphic image from their site, above) invites fans to send birthday wishes to Shrewsbury's favorite son, British naturalist extraordinaire Charles Darwin, blogged here early and often. While Leader of the Free World-Elect Barack Obama channels Abraham Lincoln as "the world" looks on in shock and awe, admirers of Charles Darwin are getting ready to celebrate their hero's 200th birthday, together with the 150th anniversary of publication of the great naturalist's earthshaking On the Origin of Species by Means of Natural Selection, or the Preservation of Favoured Races in the Struggle for Life (full text available online here). "There is grandeur in this view of life, with its several powers, having been originally breathed into a few forms or into one," we quoted from Charles Darwin's The Origin of Species in a caption accompanying this image taken from the deck of the schooner "Friendship" heading out of the Chelsea Creek on a sunset cruise three years back, "and that, whilst this planet has gone cycling on according to the fixed law of gravity, from so simple a beginning endless forms most beautiful and most wonderful have been, and are being, evolved." And here’s another perversity of human nature. Many conservatives resist the theory of evolution even though it confirms many of conservatism’s deepest truths. We suspect it has to do with our species' primal hard-wired fear of being watched and the concomitant — do you love that word as much as we do? — "natural tendency to believe." We are not at all surprised to find faith-based protestations on both sides of the aisle. Compare the Young Earth Creationists who "believe that God created the Earth in six 24-hour days on the right with the similarly willfully anti-scientific Al Gore-allied Anthropogenic Climate Changeists on the left whose fire-and-brimstone sermons declare that "the debate is over" and "scientific consensus" is the last word. The coldest winter in years be damned! “'It is not the strongest of the species that survives, nor the most intelligent that survives,' wrote Charles Darwin," we captioned this image last April, adding "Yes, you, Ben 'No Intelligence Allowed' Stein." Opponents of Darwin traditionally have been led by biblical literalists, whose "arguments" on the subject have been generated mostly by the Book of Genesis. Now their camp includes some of the most prominent thinkers in the conservative intellectual movement. As a matter of historical curiosity, this new turning of neocon eyes toward heaven comes just as Pope John Paul II has officially recognized that "the theory of evolution is more than an hypothesis." Indeed, it comes as evolutionary thinking itself is shedding considerable light on an array of questions and problems, from brain growth to the development of immune systems, from sociobiology to economics, from ecology to software design. Such research is yielding anti-designer results. F.A. Hayek long ago recognized the phenomenon of "spontaneous order" and described how it arose in markets, families, and other social institutions. Now, ingenious computer models are confirming Hayek's insights. It is increasingly obvious that social systems, from commerce to language, evolve and adapt without the need for top-down planning and organization. Order in markets is generated through processes analogous to Darwinian natural selection in biology. In other words, we can indeed have apparent design without a designer; the world is demonstrably brimming with just such phenomena. Forget about the impotent Ben Stein. Is Baracko Bama listening?